To help contractors grow their business by providing the best decorative and specialty concrete material systems and coatings, by having extensive product knowledge in order to provide the best technical support and advice, and by offering expert training. At Turning Point Supply we bring over Fifty Years of construction industry experience to help you grow your business. We have partnered with leading manufacturers in decorative and specialty concrete products, covering the full range of material systems and coatings you need for most projects. Our staff has extensive product knowledge and can help you select the best material system to fit the budget and performance requirements of nearly any project. We will help you with material takeoffs and pricing, and give you expert advice on substrate preparation and product application. We offer professional training with classes scheduled throughout the year, plus Crew Training designed specifically for your business to teach you and your entire crew the material systems you need to grow your business. Work with us and you will use the best decorative and specialty concrete material products applied and installed correctly to help reduce your labor costs and eliminate costly call backs. Work with us and you will grow your business and make more money. Given the chance we will EARN your business. 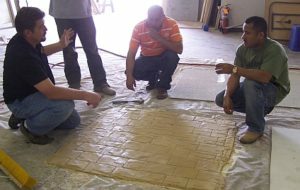 Our main focus is knowledge: we want you to know what’s available, what material system is best for each project, how to assess and prepare concrete for your work, how to properly apply and finish the product. And, most important, how to make money doing it all! You might get what you need from one of our regularly scheduled classes, or we may need to set up Crew Training specifically tailored to you and your team. Our Charlotte NC warehouse and showroom is conveniently located near the interchange of interstates 77 and 85. You and your customers can see large samples of decorative concrete overlay products, concrete stain materials, epoxy metallic systems, epoxy flake systems , concrete countertop materials and many other system applications in our showroom. Our Raleigh NC warehouse and showroom is also conveniently located, near the interchange of Interstate 540 and Highway 1. Our warehouses are stocked with the materials you need for pick up, and we offer same-day shipping throughout North Carolina and South Carolina, usually with next-day delivery. We have the SureCrete Design Products OnDemand Pigment System and can provide you with over 200 colors in water- and solvent-base acrylic sealers, waterborne and 100% solids epoxy, water- and solvent-base polyurethane, and polyaspartic. SurfKoat Surface Koatings systems include concrete dye coloring products, acid stains, epoxy and polyaspartic systems, acrylic sealer cure and seal products. Florock Polymer Flooring is the leading manufacturer of commercial and industrial concrete coating systems including epoxy systems, urethane cement floor finishes, epoxy mortar concrete floor coatings, containment systems, Novolac epoxy, ESD and conductive. Our showrooms are open weekdays from 7:30 am to 4:00 pm, and by appointment. Feel free to drop by during our open hours to talk about your project, give us a call at (Charlotte) 704-333-4235 or (Raleigh) 919-794-7442, or Contact Us with any needs or questions. From Interstate 77, take Exit 12 and head west on Atando Ave. After about one mile, turn left on Timeplanner then right on Upper Asbury. Bear left on Service Rd. then turn left onto Graphic Court. From Interstate 85, take Exit 40 then turn left on N Graham St. After 1.4 miles, turn right on Toal St., follow Toal onto Service Rd. then turn right onto Graphic Court. I-540 East Exit 16 to US-1 North Capital Blvd. | 0.4 Miles First Left onto Capital Connector; 0.1 Miles Left onto Capital Hills Dr.; Half Mile Right onto Gresham Lake Rd. ; Half Mile Right onto Wellborn St.; 0.2 Miles Right onto Wellington Ct.; Second Building on the Right. I-540 West Exit 16 to US-1 North Capital Blvd. | 0.2 Miles First Right onto Gresham Lake Rd. ; 0.7 Miles Right onto Wellborn St.; 0.2 Miles Right onto Wellington Ct.; Second Building on the Right. Hopkins NC – 15 miles, Mitchell Mill Rd. Millbrook NC – 4 miles, Litchford Rd.